It’s back-to-school time which means parents are scrambling as they navigate the long list of needed school supplies. Backpacks, binders, flash drives, crayons, lined paper. They’re all on the list! For the 23 families at Haven House in Menlo Park, their back-to-school shopping needs were met in one action-packed, smile-filled afternoon. 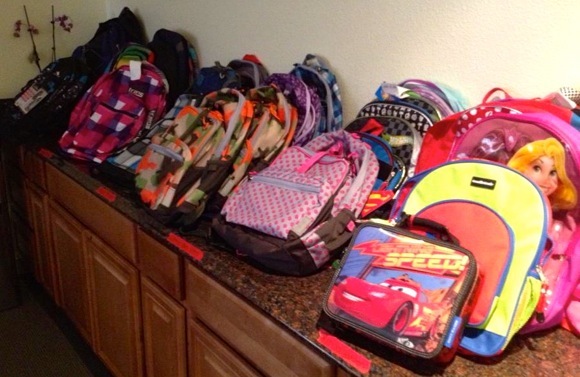 The kids lined up earlier this week to select a backpack and fill it with all the supplies they’ll need for the year. Younger kids found crayons, markers, glue sticks and scissors, while the older kids were able to pick out binders, paper, rulers, and flash drives. Every kid found exactly what they needed. Thanks to the generosity of Trinity Church, the school-aged residents at Haven House were provided with all the needed supplies. Best of all, it was one-stop shopping as a conference room was converted into a great store. Kids dashed in, found that perfect looking backpack, and then circled the room to fill the backpack with grade appropriate supplies. After they received their backpacks, they followed cute footprints that some teenage volunteers had cut out and taped to the ground around to the Community Room where representatives from My New Red Shoes were passing out new shoes to all the kids and also Old Navy gift cards. It was a successful afternoon, which concluded with smiling faces and great enthusiasm for the school year that begins next week.